On the Transitions tab, in the Timing section, check the After check box and set the slide to advance after 3.00 seconds or so. You’ll probably go back and adjust the timing later. Insert a new slide and insert the announcement. In my case, I inserted a screenshot from my website, but you could type text from scratch. The slide background should be white or at least something that contrasts with the curtain color. 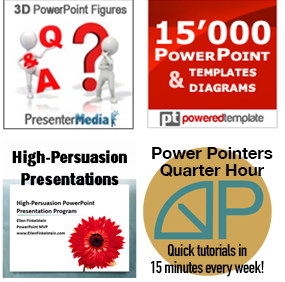 Just to remind you, here’s where you can find out more about Power Pointers Quarter Hour. How could you use this effect? Can you think of other short animations that you could use? Leave a comment and please use the Share buttons below to tell your colleagues. That’s way cool. I can see lots of uses for it, including social media posts.